How can we ensure the effective use of mobility devices to help patients ‘get back on their feet’ after a temporary injury? While creating long term habits of mobility device use is very important, we think that we might be able to address the usage of mobility devices for temporary injuries in a better way during this semester. We also believe that if we can develop an innovative solution addressing this issue, we might be in a better position to address the long term issues, because recoverable injuries, if not treated thoroughly, could cause permanent damage. Even though we are excited to develop new mobility devices that can help patients, we realize that this is only a part of the issue, and that without proper training and an assessment of both indoor and outdoor barriers, mobility device users are at a disadvantage. For example, recommending the use of a device without physical therapy for training with it, reduces the positive impact a device could potentially have. Moreover, environmental barriers or cognitive limitations that might impact user safety are often not identified or taken into account. Our team believes that taking a Human-Centered Design (HCD) approach will allow us to reach a holistic and systems perspective that will consider various components (such as the device, the training/exercises it can propose, the user interface etc.) and stakeholders in the system (not only the patients, but also the doctors, the physical therapists, patients’ family and others important to them). Taking the HCD approach will allow us to develop a device that can truly support patients after an injury, and possibly help them develop better habits that will increase their mobility for the future. Imagine us designing a device that helps not only get the patients ‘get back on their feet’ but develop new and healthier mobility habits! Our health care system is really complicated. Hence developing a new mobility device with an understanding of the complex system it participates can dramatically improve the chance of short and long-term recovery of patients. Existing research shows that the elderly population (technically termed as the geriatric population) with an injury tend to become even less mobile and frail. While some hospitals have tried to address this issue, more must be done. There are also cases of elderly persons who are discharged from the hospitals with very limited assistance and little to no physical therapy. Both these cases increase the chances of another accident. Developing an assistive device for mobility, which could be used by patients in hospitals or home could have a major impact in improving their health and life. 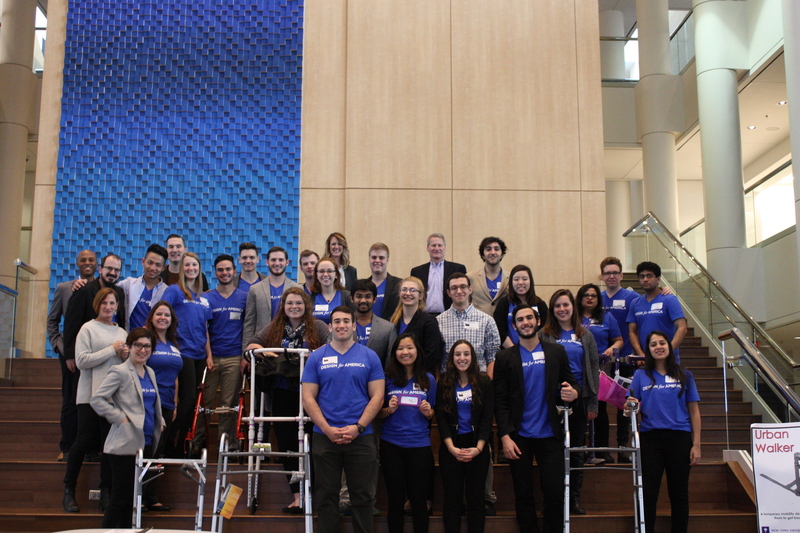 Our team comprises of students who have significant experience in design thinking, working with the mobility issues and providing care for the geriatric population. However, we also have students who have recently joined and want to experience the human-centered design process. 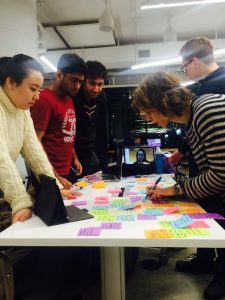 We are expecting to learn as much as possible on prototyping, information research, new methods of ideation, and ways of creative problem solving. The most important thing we will gain is the experience of working as one team of distinct individuals to solve a prevalent societal issue. We hope to develop innovative prototypes and devices that can help improve the life and mobility experience of the elderly. We have diverse and multidisciplinary team. We believe this will help us tackle this challenge uniquely because of different mindsets. 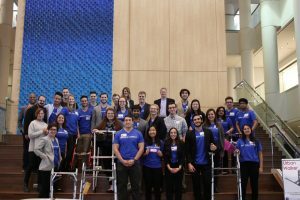 Our team is composed of undergraduate and graduate students from different majors and schools, with a diverse set of skills and interests: Nursing, Mechanical Engineering, Electrical Engineering, Design and Digital Arts, Industrial Engineering and Robotics. Our professional mentor is Physical Therapist who is also an NYU alumnus and will provide us with knowledge as well as access to users and experts in the field. 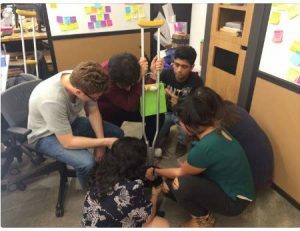 Our two faculty advisors have tremendous experience in working with students; one brings a great technical and prototyping expertise and the other has a deep understanding of the Human-Centered Design Process. 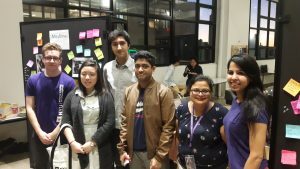 We also have the chance to be part of the rich NYU ecosystem, and various NYU organizations have shown interest in supporting the project in any way possible. Apart from these, our Professional Mentor is also hoping to be able to provide us access to patients during the research and prototyping phase. We also plan to contact Senior Centers and Naturally Occurring Retirement Communities, since these are the places where the geriatric population prefers to be for various programming. The project was announced by DFA Nationals in August 2016. After a good 2 weeks of hunting, 6 team members were selected. The challenge was to build a mobility device that helped the elderly. The team decided to focus upon the elderly with temporary mobility issues, because if the temporary issues were taken care of, there would be less chances of dealing with permanent issues. The team did an 8 week design sprint where they spoke with experts such as Anita Perr, Abraham Brody, and their mentor, Shraddha Bhatia. This is how they obtained the knowledge of how the elderly faced mobility issues because of the environment they were living in. This is why they decided to focus on the population in the New York City area. 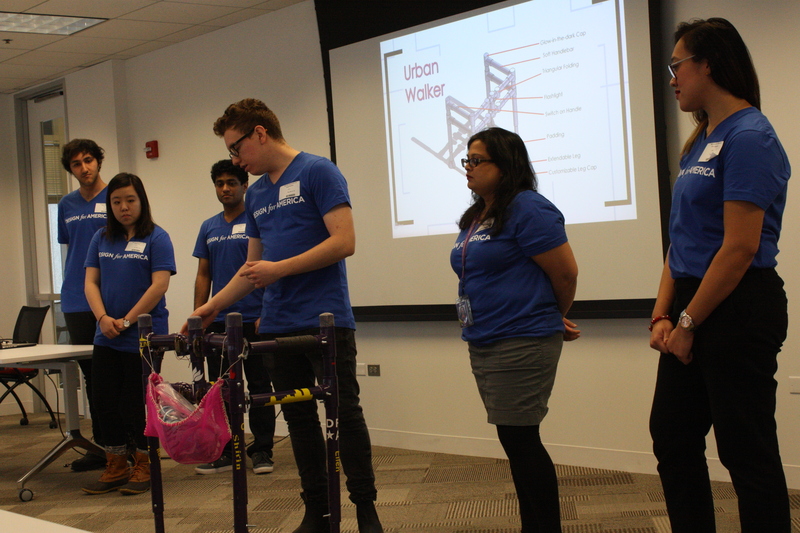 After conducting various interviews with many elderly, the team synthesized onto three solutions, but finally decided to build the urban walker. 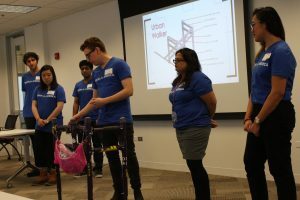 The team built a walker that was safe and user friendly to help the elderly not only recover, but recover in a faster and motivated way. 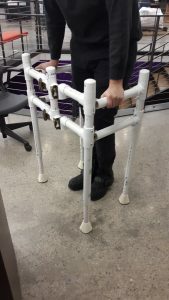 The Urban Walker is a temporary mobility device for the geriatric population– to be used after an injury– that motivates them to get back on their feet quickly, and avoid long term negative consequences by promoting activity through personalization. The walker is compact, has a light, has glow-in-the dark features, comfortable handlebars, extendable legs, customizable leg caps, and flexible padding. When tested with the users at the senior community center, they liked the, especially the comfortable handlebars and the compact nature of the walker. Medline is looking into patenting the concept.